November saw an eery monster galavanting through eastern Kreuzberg, a district long faced with the destructive problem of displacement of local people and businesses. The monster was arresting enough, but more impressive still were the hordes of enthralled candlelit children thronging through the streets in its tow. Parents and other adults also took part – and in significant numbers. The monster swept up a thousand people and drew them along behind it, stopping the traffic in some of Kreuzberg’s busiest main roads as they went. Lantern processions are common in Germany at this time of year, but this one was unusual for its size (a thousand people) – and for the unexpected apparition at its head. 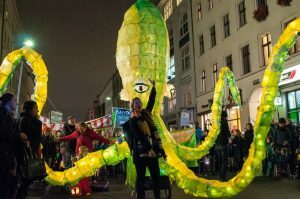 It looked a lot like a giant yellow and green octopus – missing the odd tentacle or two, but still clearly thriving in the chilly Berlin night air. It was carried enthusiastically aloft on poles by willing local volunteers – who had carefully assembled it from everyday household materials. A physical manifestation of powerful forces at work in the locality, with tonight’s event lending these a form as yet unseen on these streets. This latest public demonstration organised by the neighbourhood action group Bizim Kiez (the name means “Our Neighbourhood”, and the long-armed monster was given the initiative’s official colours of green and yellow) ingeniously turned the darkness and cold weather of the season to its advantage by surfing on the tradition of St. Martin’s processions, but with a twist. And what a turnout! The creature’s progress was occasionally interrupted for speeches to highlight the purpose of the march. The focus was on the loss of, and further threat to, important social facilities in the area, including independent childcare and other educational facilities, typically due to the liquidation of their rented premises without regard for safeguarding provision of equivalent services. Many social facilities, such as nurseries, occupy their premises under commercial rental contracts without any protection against eviction by landlords and landladies increasingly being made offers they find hard to refuse by large investment companies. A common threat to providers of social facilities arises when an investment company (typically well-resourced and located far away from Berlin) purchases the premises (or the building which houses them) outright, which is inevitably followed by the rent being raised to levels unsustainable for those providing care to children and the elderly, resulting in enforced closures of vital local services. These services are not being replaced: this type of property speculation, currently widespread in Berlin, is stripping value out of the social infrastructure of local neighbourhoods, without any being added back in return. The march served to draw attention to the growing social deficit, and articulated the demand for the introduction of compulsory quotas of protected rents for social usage. You might have thought the giant glowing yellow-green octopus had been chosen to symbolise monstrous giant property investors, with long arms able to reach in and grab even from far outside the city; but first impressions can be misleading. It turned out the kraken had been selected as an empowering symbol of the strength, power and connectedness of the local community organised to fend off asset stripping of social infrastructure – a force from below to protect the neighbourhood’s children from marauding sharks.